Marrero, LA, July 02, 2018 --(PR.com)-- The Council of Bishops of the Greater Bibleway Church International (GBCI) announced the following statements: "Racism seems to be having a moment, whether it's your local legislature, at your car share service, in the syrup at your local breakfast stop or disrupting your cup of coffee at your coffee shop of choice. 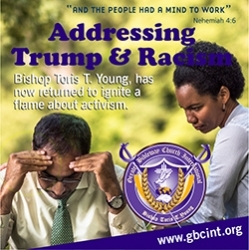 We have seen a rise in race issues at morning worship services of local and national congregations, the political ads are seen on social media platforms filled with racism and hate speech and hateful actions," stated Presiding Bishop Toris T. Young and Senior Pastor of Greater Bibleway Church International. "Incidences of overt racism & hate seem to make news on a daily. Often times as a response, many institutions hire executives armed with the ability to handle the complex landscape of racial bias with a temporary fix." Bishop Toris T. Young encouraged tens of thousands of participants in a candlelight march, led by many prominent clergy, civil rights, and those of other organizations, as they filled the over 5,000 seat sanctuary, foyer, and steps of the church. Bishop Toris T. Young said in his message, "As church leaders, we must work and live to eradicate racism/hate in and around the world, but charity starts at home in The United States Of America." "Racism is America's Original Sin," Young said. "We are Christian leaders bearing moral witness to the teachings of our faith in the public square in our nations capitol. As citizens we want our government to reflect our values; as a Bishop, I believe we should follow the teachings of Jesus - who taught us to love God and love our neighbor." Bishop Toris T. Young went on to say, "Bigotry and racism/hate is not new to the United States Of America. Thousands have lost their lives as a result of racial tensions. But then such views were pushed to the margins and from public view. Now, however, with a more sophisticated marketing machine and more soothing words, racism has taken on new forms, including in the alt-right. For the first time, in a long time, the masses of this movement are proudly showing their faces (no hoods this time). And we must be willing to acknowledge that they have been emboldened by the rise of Donald Trump and the values and rhetoric surrounding his 2016 Presidential campaign. Although the President seems to teeter-totter between silence and condemnation, the table has been set. The truth is, it is clear that many in the alt-right movement feel as though a door has been opened for their supremacist worldview, and that 'Make America Great Again' was about warped definition of a great nation. This is not O.K." Bishop Toris T. Young said, "Now, let me be clear, I do not think every or even most, or even 'half a basket of deplorables' of Trump supporters are these kind of people. But lets be clear, if you are a Trump supporter and you refuse to stand up against the hate, racism, and bigotry, you are part of the problem that fuels this agenda in America." Greater Bibleway Church International, Council of Bishops and Presiding Bishop Toris T. Young states the following: "We must not respond in silence, and we can speak at our churches, schools, playgrounds, public places and open forums. We must speak to the moment. And our commitment to love the world that God loves cries out for us to stand together with those who are on the receiving end of hate. Silence is simply not an option. Three things we call on leaders, churches and people might do tonight on their knees and tomorrow and the days to follow: seek the face of God individually, and collectively. When what we see grieves us, our first course of action should always be prayer. No amount of activism and tweeting can replace going before the One who can heal all the brokenness in this world. As church leaders we pray alone, we pray in groups, and equally importantly, we lead our congregations in prayer, encouraging each person to plead for those who are being hurt. Condemn bigotry, hate discrimination and racism from the pulpit and through each ministry in the church to include the community you live. Because as we pray, we speak up. Our voice is necessary to remind those under our care and those listening from outside that when there is wrong in the world, we fight for what is right. Call this what it is and then call it wrong. Reach out to those who are experiencing anxiety or fear as a result of the rhetoric of those who seek to instigate hate. Our arms of love and solidarity are a powerful example of the One who stretched His arms wide for all of us. We preach the gospel reminding those who are on the receiving end of hate that above all there is a God who loves them deeply, dearly, and always. Greater Bibleway Church International announces that we will publish a list of church leaders in the United States that teach or are silence about hate, racism bigotry or discrimination."